Situated in a stone house in the small Provençal town of Pougnadoresse, this guest house features views of the nearby castle and the surrounding countryside with its vineyards and farms. Rooms are comfortably decorated and offer views of the castle or countryside. Located in La Capelle-et-Masmolène, Mas du Moutet offers guest house accommodation. The property features a garden, furnished terrace and an outdoor swimming pool. The Rhone Retreat features a seasonal outdoor swimming pool, BBQ facilities, a garden and terrace in Gaujac. Featuring a business centre, this property also provides guests with a restaurant. The Clos de Pradines is located in Saint Quentin la Poterie, close to Nîmes, Alès and Avignon. The property offers a terrace with a panoramic view of the Uzès Valley and the outdoor swimming pool. 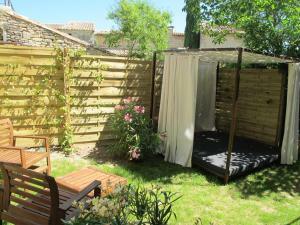 Located in Connaux, Le Bernon is 15 km from Uzes and 3 km from Gaujac. It offers individually decorated rooms, a terrace and an a à la carte restaurant with a fireplace. Just 4 km from Uzès, Chambres D'Hôtes Le Mas du Caroubier is an 18th-Century farmhouse located in Saint-Quentin-la-Poterie. It offers an outdoor swimming pool, tennis court and massages. Located a 5-minute drive from Uzès, this 2-star holiday village is located on a 12-acre site in the countryside. It offers fully-equipped bungalows and a seasonal, outdoor swimming pool. Set in Flaux, 26 km from Avignon, Le Blanc Mûrier features an outdoor pool and views of the pool. Free WiFi is provided and free private parking is available on site. Located 2 km from the centre of Saint-Quentin-la-Poterie, Les Baumes offers bed and breakfast accommodation with an outdoor swimming pool and terrace. Free Wi-Fi access and free private parking are provided. Featuring a spa bath, Villa Uzès - PRV041009-O is set in Uzès. This holiday home features accommodation with free WiFi. La Closeraie is a hotel nestled in parkland in Pouzilhac in Provencal Gard. Avignon is 27 km away and Orange is 33 km from the property. Offering a seasonal outdoor pool, Maison Très Agréable Dans Village is located in Saint-Paul-les-Fonts. Free WiFi access is available in this holiday home. Le Fer en Cèze is located in the heart of a hamlet in Sabran, surrounded by vineyards. The property is 7 km from Cascade du Sautadet, 5 km from La Roque-sur-Cèze and 32 km from Orange. 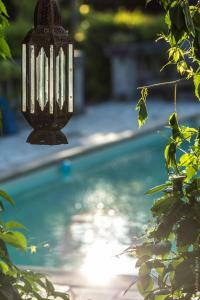 Boasting an outdoor pool and garden views, Le Fer en Cèze is located in Sabran. This property offers access to ping-pong and free WiFi. Located in the hamlet of Audabiac 18 km from Uzès, Domaine d'Audabiac is a 19th century country house offering B&B accommodation with a swimming pool. The house features original flooring, high ceilings and views. Tämä Languedoc-Roussillonin maaseudulla sijaitseva hotelli on 20 minuutin kävelymatkan päässä Uzèsin kaupungista. Hotellin ensimmäisessä kerroksessa on ulkouima-allas, terassi ja kukkapatio. Featuring accommodation with a private pool, mountain view and a terrace, 19C Provencal Stone House with Private Pool is set in Uzès. Guests staying at this holiday home have access to a fully equipped kitchen and a patio. Featuring a seasonal outdoor pool and a garden, Domaine de la Source offers self-catering accommodation located 1 km from the centre of Uzès. 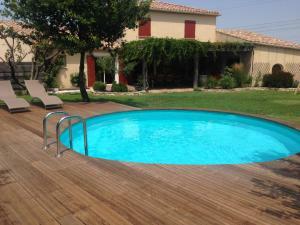 The property is 6 km from Uzès Golf Course. Set in Uzès in the Languedoc-Roussillon Region, 31 km from Avignon, Chambres de l'Artémise boasts a spa centre and hot tub. The hotel has a seasonal heated outdoor pool and views of the garden, and guests can enjoy dinner at the restaurant.